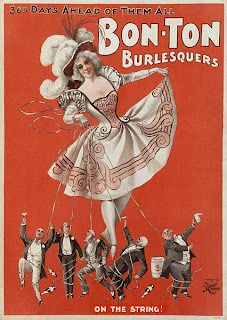 Before I start this article, I thought it would be a great idea to include a quote I read recently on a blog about this movie as well as links to burlesque videos (click on the artist's name) - two current and two historical. 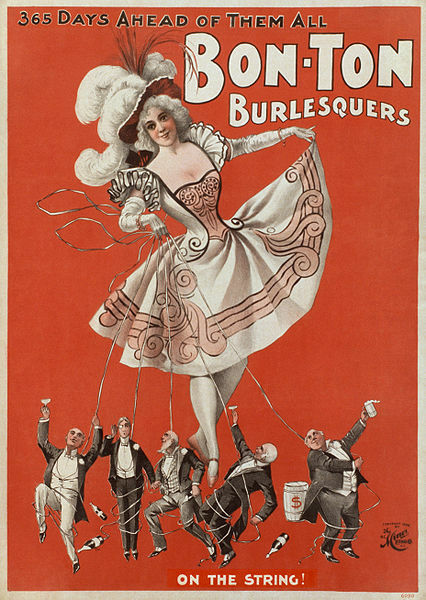 "What is known as burlesque now is more of a neo-burlesque movement of performers who mostly perform stripteases, humorous skits, cabaret, and even novelty acts that would include fire-breathers or contortionists. As it is now, it is a show of unusual entertainment that is not meant to be your average type of show. It takes influence from the vaudeville scene, despite the way that vaudeville performers often looked down upon burlesque performers...The movie seems to make the burlesque scene seem as though it's a glittery jazz and strip show when it's not very... well, 'burlesque' at all." Now that you're in the right mind-set, I first want to say I really enjoyed watching this movie. I love singing, I love dancing and I was a stage costumer for five years, so what is there not to love for me. At the same time, all through the movie I was thinking - great Hollywood movie, nothing to do with Burlesque. I'm no expert, but I think it really turned Burlesque into a Vegas dance revue. 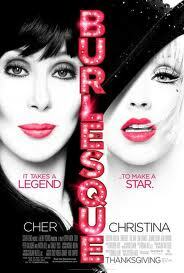 Any one who loves the big Vegas show and/or Cher and Christina will love the movie. Anyone looking for true Burlesque will be very disappointed. The story is of a small town girl (Christina), self-taught it is implied - a la Flash Dance (don't know this reference - click on the link). She makes it to LA to try and get work as a singer/dancer only to end up as a cocktail waitress in a burlesque club (again, using the term in the movie's context). Through sheer determination she manages to make it into the chorus. When she ends up stepping in for the drunk star of the show who cuts the sound track with pre-recorded vocals in spite, she starts belting her own amazing version of the number and the band steps in on cue. Of course, the back-up girls quickly figure out how to improvise and the number is a great success. I know it's a predictable plot, but it was fun anyway. The owner (Cher) recognizes her star ability and builds a new show around her. Funniest line in the movie for me is when the drunk star out of jealousy refers to Christine as someone with "mutant lungs." Totally Hollywood story, totally cheesy, but the the audience eats it up anyway. All of us who dreamed of being a professional dancer love this plot - especially if we didn't start young and have great training. Add in a bunch of well choreographed, costumed and performed dance numbers and a love triangle including an evil businessman to round out the plot and we'll be there. Not all movies are about being great classics. Some are about just having fun and coming home feeling good. The only real surprise for me is, given the great dance numbers in the show, I find the quality and variety of the promo pictures VERY poor, so my apologies. So if you are ready to check reality at the door and just enjoy a musical, I would give it a go. If that's not your cuppa, or you hate Christina and Cher, don't bother as you'll be totally bored. I would still check the local burlesque performances available. As an art form, it is ever evolving and each performer brings something unique to the genre. I personally love the wide variety of female forms found and the way they celebrate their sexuality in defiance of what the fashion industry keeps trying to dictate. In Vancouver, BC, if you are very new and want a great overview, I would suggest starting with the Vancouver International Burlesque Festival held every year in May. Information can be found on their website. Reviews of local performers you might want to check out can be found on Yelp. P.S. Victoria was was nice enough to comment on this column letting me know about weekly shows in Vancouver - Kitty Nights at the Biltmore - that have only a $5 cover. For links to see some show photos check out the comment below.